As winter fashion continues its crusade through the upcoming weeks, Celine maintains its relevance as a dominant force throughout the season. The looks of their spring/summer 2019 runway show can easily be worn during the winter as well, with minimal effort to recreate the outfit yourself. Style Advice: In order to recreate the great looks of Celine’s spring/summer 2019 runway show, one does not need to overthink the process. Start with the Oxford Banker Striped Shirt ($99) from GANT, as it will act as a great contrast underneath in a dark black suit jacket. The vertical stripes will help break up any monotony within the look. For the actual suit itself, it’s best to find a retailer who can provide the entire look at once. 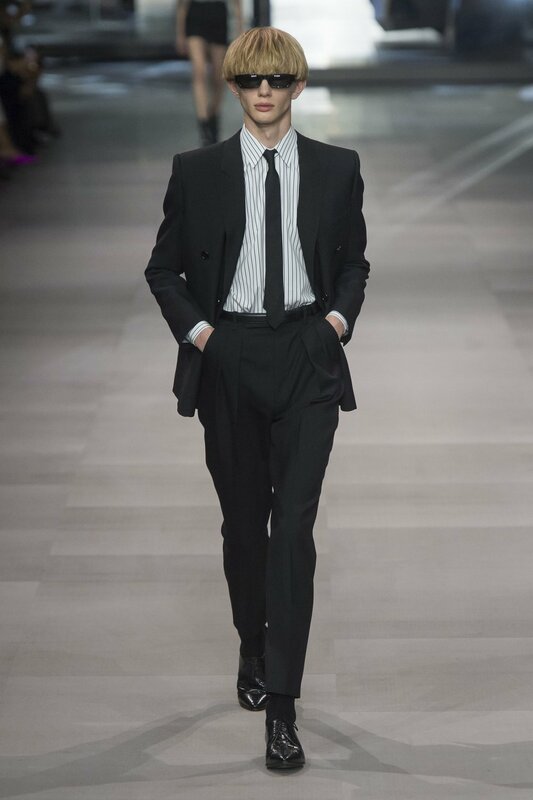 Go to Zara, as they offer the Water Repellent Black Suit, whose pieces can be purchased separately to recreate the entire outfit. The Water Repellent Suit Jacket ($150) is the best place to start, as it’s intentionally designed to be worn well with the Water Repellent Suit Pants ($80), and the Glossy Black Shoes ($90). To finalize the look, go to Urban Outfitters for the UO Vader Mod Square Visor Sunglasses ($20). It’s sleek design will fit well with the formal style of your suit. Must Have: Whether you’re trudging through snow or sliding on ice during a night out on the town, it could not be bad to pick up a pair of stylish sneakers that are more suited to a casual type of night. Purchase Gucci’s Ace GG Wool Sneaker ($650), as it’s a great combination of stylistic sensibility and practical footwear for the season which could use the most traction. The Ace sneaker itself has been a mainstay of Gucci for a long time now, as the shoe features a rubber sole with red stripe detail and white leather trim, along with blue and red GG wool. The classic design of the shoe itself has been continually updated since the 1970’s, being reintroduced time and time again over various Gucci collections. If you’re going to be purchasing a pair of sneakers to brave the slick streets of your city, you might as well buy something that’s as stylish as it is practical. Only a few days after luxury brand Chanel vowed to ban exotic animal skins from their production lines, Burberry has teamed up with Vivienne Westwood to aid the rainforest in their latest collaborative campaign. The biggest takeaway of the star studded collaboration is an oversized T-Shirt featuring a note from Westwood herself, encouraging viewers to support Cool Earth, a non-profit organization working to reduce forest deforestation and protect the quality of rainforest communities. Cool Earth works to “end the cycle of deforestation entrenching villages into further poverty,” according to the official site. Besides spreading awareness with the T-Shirt, Westwood is planning on making four exclusive pieces that will be auctioned off to raise funds for the non-profit organization. The aforementioned collaborative collection is Burberry’s first under newly appointed chief creative officer Riccardo Tisci, and it is currently available now on the brand’s website as well as within the New York, Paris, London and Hong Kong stores.